Have you ever wanted to create your own Gospel tract? That's one of the main reasons we exist! Our goal is to help you create the best tract possible; one that is a perfect fit for your outreach, event, or witnessing style. Perhaps you have just an idea for a tract you'd like to see produced. That's ok! We can help you from start to finish! Maybe you're graphically inclined and have a tract that is almost completely designed already. We can help finish it out and give you a professional final product. No matter what level of involvement you need from us, we can help! If you're just getting started, first try to figure out what style of tract you'd like. 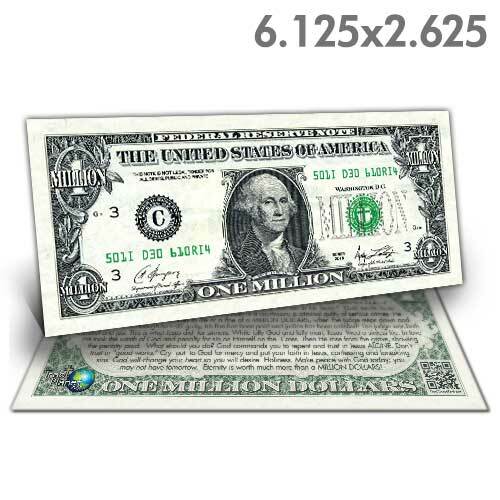 Our standard styles are card-type tracts, money tracts, and folded tracts. Below you will find the different costs and design fees associated with different styles of tracts. If you require something not listed, let us know and we can give you a custom quote! Next, send us an email to let us know what you have in mind. Please include anything you have up to that point (if you have a Gospel message started, if you have some sample pictures you'd like to use, or whatever). 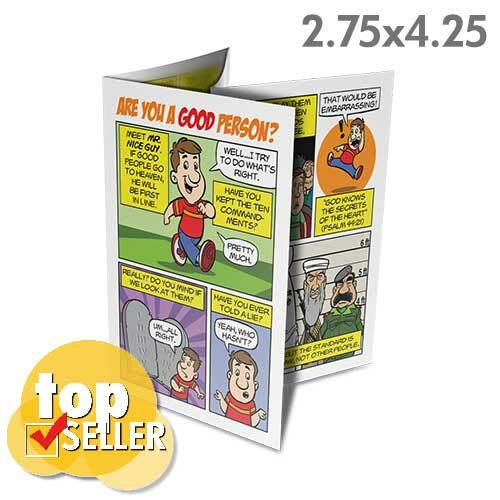 We will work with whatever ideas you have and come up with a great looking tract! We will keep you in the loop and email you proofs once they are complete. Then you simply email back any changes you want. This process continues until you are completely satisfied with the design. Once the design is approved by you, we will create a custom item in our store with a permanent link. You will be able to select the quantity you want, and whether you want them shrink wrapped in bundles of 50 or 100 (to make carrying them easier). That is also where you will pay the design fee. Since it's a permanent link, you will be able to come back to the link any time you wish to re-order. You can also send the link to friends and family that may be interested and they can purchase the tracts as well! The design process can take anywhere from one day to several weeks, depending on how complex the design is, and how quickly the tracts are needed. Having more information to work with at the beginning (completed Gospel message, sample images, etc.) can greatly reduce the design time of your tract. Typical printing time is roughly TWO WEEKS from the time your tracts have been approved and ordered through the website. If you need a tract done for a certain event, please contact us as soon as you can, and let us know when you need the tracts. We will do our best to accommodate you. Gospel Tract Planet reserves the right to carry ANY custom tract in our store if we choose to, whether in it's original state, or slightly modified. 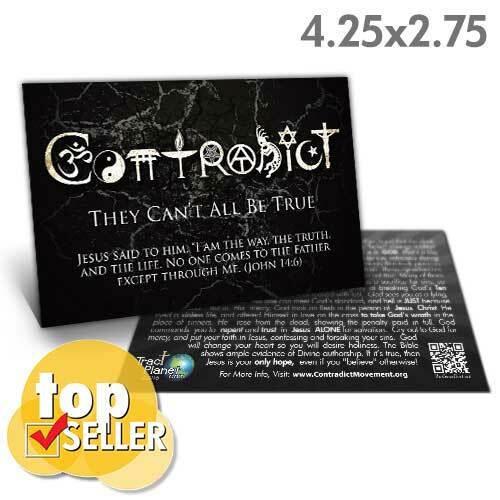 Typically all custom tracts are available in our "Custom Tracts" section of our website. Occasionally, we will decide to have the tract printed and offer it for sale on a pack-by-pack basis. This policy does NOT apply to tracts completely designed by the customer. For example, if you already have a tract designed and only need it printed, we would not carry it on our website in any way unless you granted us permission to do so and we agreed to the arrangement. Under no circumstances do we pay royalties or commissions on tracts that are sold, either on a pack-by-pack basis or when ordered in bulk. The concepts in these two messages will help the Gospel make sense to an unbeliever. We STRONGLY recommend listening to these two messages before writing your tract! Below are the prices for the different Gospel tract styles. Please note that these prices INCLUDE shipping within the lower 48 states in the US. For orders outside of the US, (and Alaska & Hawaii) there is an extra charge for shipping. Prices DO NOT include shrink wrapping, but this option can be added for a small charge. The cost starts at about $25 for 500 tracts and goes up from there, depending on the quantity you order.